Ask any player and he’ll tell you that the drive up Magnolia Lane is one of biggest thrills in golf. Ask him on Friday and you might be lucky to get a response. As 48 players prepared to do battle with Augusta National over the weekend, another 48 were slamming the boots of their courtesy cars and heading home. Augusta asks questions, it pokes tender areas with a needle, prodding for the nerve. It always finds the target. If you have a weakness, the world’s most famous golf course will leave strip you of your dignity. Just ask Michael Campbell, whose various homes feature small shrines to his 2005 US Open triumph. Ten times he’s driven up Magnolia Lane and ten times he’s drive out the gates again after two rounds. With his five-year Masters exemption running out this year, this might just be Campbell’s last visit to the Cathedral of Pines. So exasperated is the Kiwi by his fall from grace (he’s ranked 563rd in the world and has made just four cuts since the start of last year) that it would have been perfectly understandable if he had climbed into the boot of his car with his clubs. “It’s the game that isn’t simple, he said. “If you’re not on your ‘A’ game, it makes us look like an idiot,” Campbell said after rounds of 83 and 81 left him joint last with Ian Woosnam on 20 over par. “It’s been a pretty miserable start of the year for me and once again mentally it’s just not there and I need get away from the game a little bit or maybe for a month or even six months,” he said. The list of high profile names to miss the cut is always a long one at Augusta. The 18 year old Japanese superstar Ryo Ishikawa has promised himself that he will win the Masters before he is 20. He’s spent the past year building up to Augusta - determined to make up for last year’s failure to play four round. He was two shots inside the cut mark with five to play before the pressure got to him and bogeyed the 14th, 16th and 18th to miss by one. And so the list went on. David Duval, Ross Fisher, Chris Wood, Vijay Singh, poor Sandy Lyle with 69-86, Henrik Stenson, Jim Furyk…. As the studs stuck around the duds hit the road. Some slammed the trunk of their cars before they headed down Magnolia Lane. If they still had the strength. 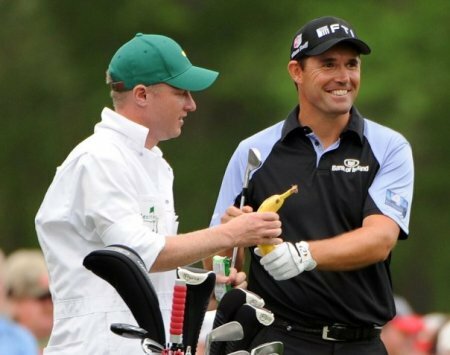 Pádraig Harrington continues his search for a new driver on the Augusta National practice ground on Monday afternoon. It’s impossible to play Augusta National blindfold but Pádraig Harrington might have to do just that - at least on the greens - to make sure his eyes don’t deceive him when he tees it up in his 14th Masters this week. 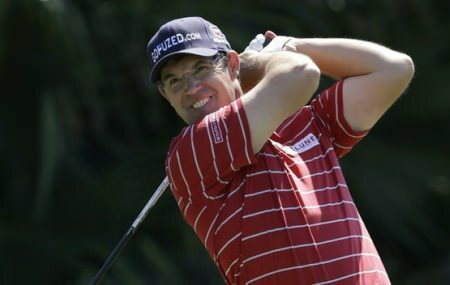 Padraig Harrington is playing his 14th Masters this weekPádraig Harrington biggest struggle at the start of this year was finding a pair of trousers that fit him. Finding a jacket to match is the next step and he’d like it to be green.